In the Configure Feed menu at the top you can select to read blogs in different languages. By default it shows only blogs in English, as well as Dot News, Project News and any User blogs who have asked to be added (only two are listed in our config). 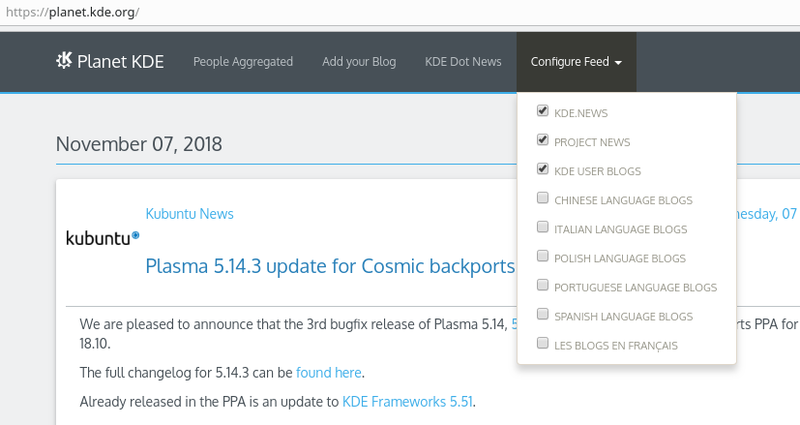 You can also show blogs in Chinese (also only 2 listed), Italian (none listed), Polish (one), Portugese (two), Spanish (four but kdeblog by Jose is especially prolific) or French (none). Work to be done includes working out how to make this apply to the RSS feed.